Around that time, a few bartenders grew out their sideburns, put on vests and started mixing Prohibition-era cocktails with obscure and interesting ingredients that had to be smuggled in from London because liquor distributors had not yet caught on to what was happening. The smuggling was part of the fun, actually: These bartenders preferred to mix their strange and wonderful drinks in tiny unmarked basement rooms that they called "speakeasies," thus allowing us all to pretend we were doing something illegal or at least illicit when at best what we were doing could be called "exclusive," which is to say that we were simply paying very high prices for very nice drinks in locations that were (for a short time) not well known to tourists. Meanwhile, on the West Coast, bartenders realized that as long as chefs were working with fresh, seasonal, locally-sourced ingredients, they might as well get in on the action and infuse some cucumbers in vodka or throw some basil under the muddler. Which was a fine idea. That brings us to about a year and a half ago, when it all went to hell. Here's what happened, as near as I can figure: The fancy cocktail movement went on a date with the slow food movement, and they had a few too many drinks, then they went back to the fancy cocktail movement's apartment, and things got a little out of hand, and together they spawned the Modern Cocktail. The Modern Cocktail might have a dozen or more handcrafted, artisanal, obscure ingredients. It might call for such things as freshly-pressed heirloom tomato water, rhubarb-vanilla-ginger simple syrup, a rinse of absinthe or vermouth, a mist of rose water, a few drops of housemade cigar and allspice bitters, and the frothy whites of a freshly-laid egg from a young Ameraucana hen who has been named after a member of the Algonquin Round Table. You may have to special-order an aromatized wine whose name you cannot pronounce. Essential oils may be involved. There could be vinegar or pickling liquid. The glass may be placed atop a board of smoldering hickory to coat its interior in smoke. Spice-impregnated sugar may grace the rim of the glass. A garnish of snap peas, sun-dried beet chips, or imported Italian marasca cherries soaked in Kentucky bourbon may confront the (by now quite thirsty) drinker trying to get at the beverage. The Modern Cocktail is, in short, a mess. This was illustrated most recently by the short-lived fame of the Bone Luge, in which alcohol is chugged through a split-apart animal bone so that some of the marrow mixes with the booze as it goes down the hatch. Awful, right? Makes you long for the days when a good-looking man or woman dressed mostly in black would just stand behind the bar and shake a few ingredients over ice and pour it in a glass and wish you a good evening. Here's the thing: Making really good liquor is complicated enough. Whiskey goes through a very careful fermentation and distillation process in wonderfully crafted copper stills, then it gets aged in a precisely charred oak barrel that may -- believe it or not -- be made only from one particular part of the oak tree because the distiller believes that branches make for better booze than trunks do, or the other way around. Gin might have a dozen or more botanical ingredients, with each flavor extracted or infused or distilled in a different manner. Vermouth has a few dozen ingredients, and those crazy old European herbal liqueurs like Chartreuse claim over a hundred. A good classic cocktail -- a Martini or a Manhattan or a Vieux Carré -- might already contain 70 or 80 distinct botanical ingredients, and that's before you add the olive or the cherry or the lemon peel. Does a bartender really need to contribute a few dozen more? Lately I've heard of gin infused with cattails, Campari infused with cardamom and bourbon soaked in barbecued short ribs. No good can come of this. So here's my advice to you, the recreational drinker, the amateur bartender, the gardener: Grow a little mint in your garden for mojitos and mint juleps. If you've got raspberries or any other kind of summer fruit you don't know what to do with, wash it well, pack it into a Mason jar, and fill it up with decent vodka. In a few days it'll be ready to filter and drink. If you're lucky enough to have a citrus tree, by all means make some homemade limoncello. But beyond that? Don't go too crazy. Even a simple drink is already extraordinarily, wonderfully complex. 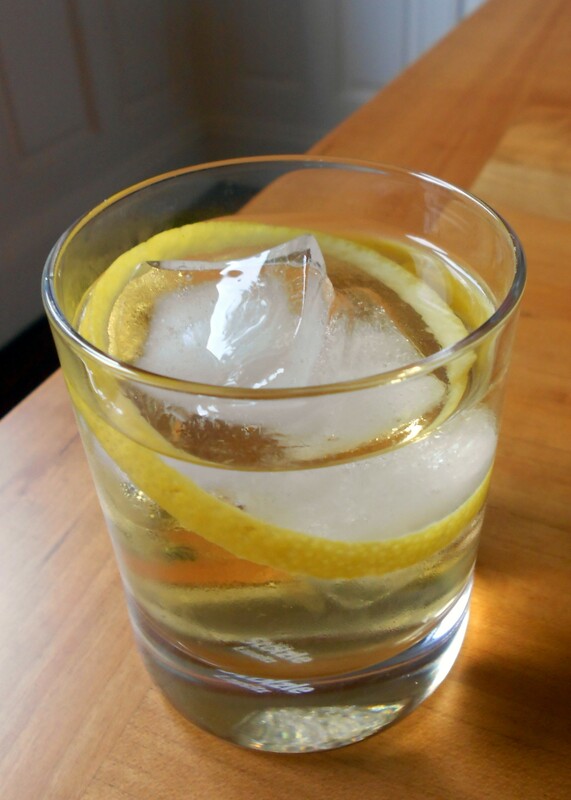 Shake and pour into a short rocks glass with ice. Add more gin if you feel like it. Drop in a lemon peel. Drink.